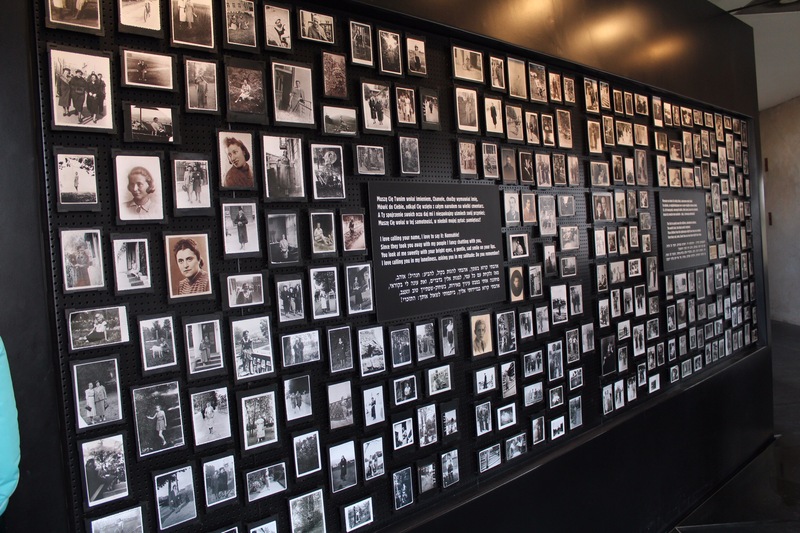 Visiting the Camps: Auschwitz-Birkenau – Watts up, world? This morning we toured Auschwitz II, more commonly known as Auschwitz-Birkenau. 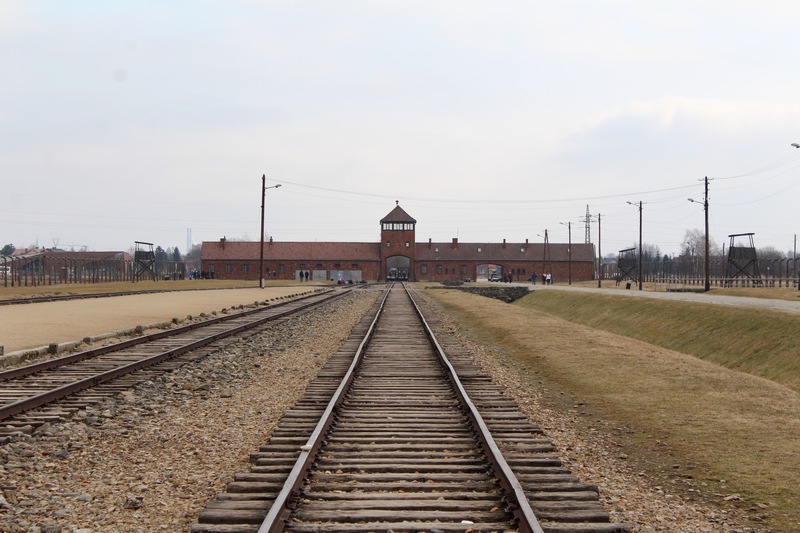 Auschwitz-Birkenau is approximately 300 acres about two miles away from Auschwitz I. Unfortunately, many of the buildings at Birkenau are no longer standing, as many of them were wooden. The gas chambers and crematoria are also no longer standing, as the Nazis had blown them up so that no evidence was left, although remnants of those buildings can still be seen at the camp. When we first arrived at Birkenau, we saw the building featured in countless photos and movies with the watch tower and room for the trains to enter underneath. It was a surreal moment, seeing such a well-known building in person. I walked along the train tracks, trying to imagine the feeling so many people experienced as they rode along those same tracks to their unknown fate, but I couldn’t. As we walked through the camp, we visited barracks specifically for children, sick women, and the buildings designated as bathrooms and washrooms. The women who were sent to the sick women’s block knew their fate. They were to be sent directly to the gas chambers, not being given food or water while they waited for their orders to the chambers. We walked back into the woods, stopping to see the remains of the gas chambers and crematoria along the way. It was hard to stand there, looking at the pieces that remained, knowing what took place behind those brick walls. We also saw the pits, now ponds, where the ashes of victims were spread. Those areas are now recognized with headstone style plaques commemorating the lives lost and buried on those grounds. The railroad at the camp has a train car on the tracks, which was donated to the camp by Frank Lowy, a businessman from Australia. His father, Hugo Lowy, was a prisoner at Birkenau. As he arrived to the camp, his only luggage was his prayer bag, which he refused to part with. Because of his refusal, he was shot immediately. After not knowing what had happened to his father, Frank found someone who witnessed his father’s murder. 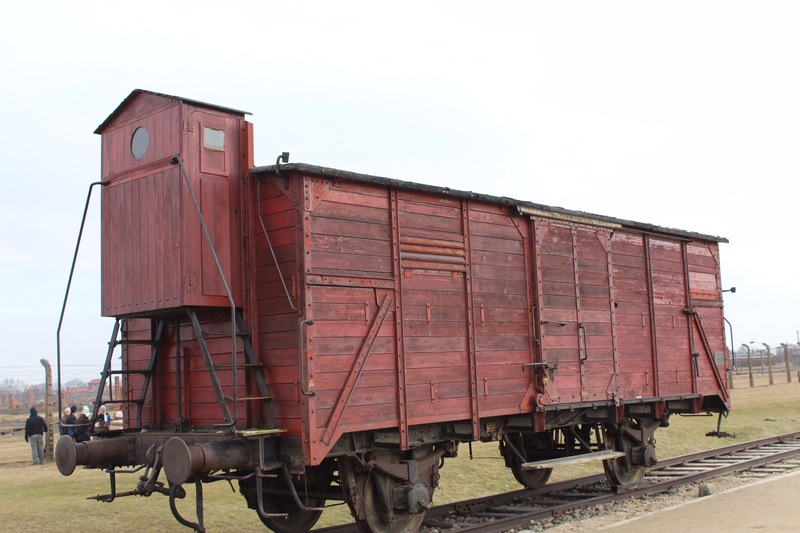 He then located a train car on the German border which he purchased and donated to Birkenau, with one request. Inside the train car, Frank placed his own prayer bag, and requested that the car remain locked after that. It has not been opened since, and Frank’s prayer bag has remained inside, mere feet away from where he lost his father. The last building we entered was a shower house in the back of the camp. As we walked through the camps, I had a very hard time figuring out what I was feeling. You hear so much and see so much that it is hard to navigate your feelings because you have so many at once. However, in the last room of the shower house, I was finally able to find my feelings, at least for that room. After the war, a suitcase was found with over 2,000 photographs of people before the war. In this room, those photos were displayed. The moment I walked in, my breath was taken away. The displays of these photos was incredible. Photos of people laughing, goofing around, with their families, friends, neighbors, living their lives. Photos of people being themselves, enjoying the lives they had when their name was not a number. People who loved and were loved and were free. I told our tour guide, Marta, that I could have spent the entire day looking at those photos. The victims of Auschwitz should not be remembered as numbers wearing prisoners clothing. They should be remembered as mothers, fathers, children, family, friends, doctors, bakers, people. In the afternoon, We returned to Auschwitz I to tour national exhibits from various countries involved in the war. This was by far the most difficult part for me. We each had our own country to research in the various buildings for an hour. My country was Hungary, and the moment I walked in the building I felt unsettled. The long corridor had closed doors on either side, and the only indication of where I was supposed to go was a tiny arrow at the end of the hall pointing up the steps. The entire first floor was dark, and the second floor where the exhibit was was not much brighter. 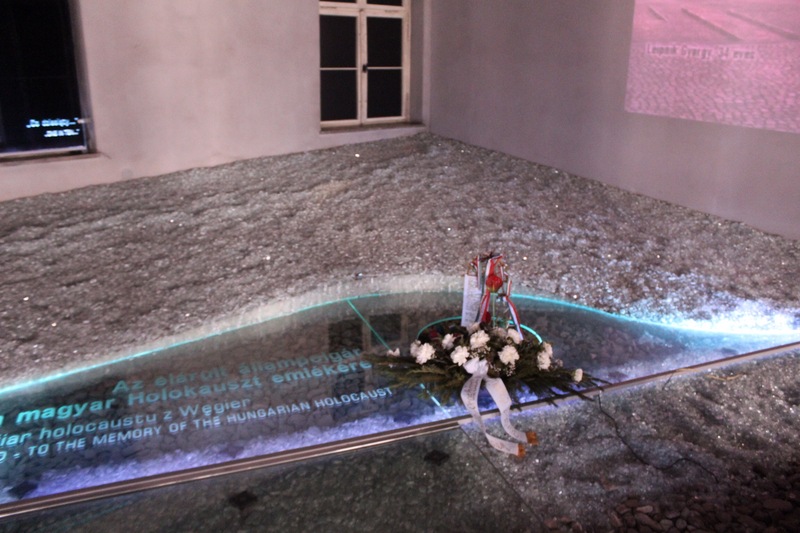 The room had a long winding pathway with illuminated plaques describing the time light of Hungary’s involvement. The room had a constant sound of a heartbeat, with dim tea lights placed around the walls with replicas of barbed wire tied around them. For the hour I was there, I was completely alone in the building for about 50 minutes. This same building had been used as a prisoner barrack during the war. As I read each plaque, I couldn’t help but notice how alone I felt. Even though I was sure I was in no danger, being completely alone in that building made me feel small, empty, vulnerable, panicked. I was so relieved when Marisa and Kaishla came in calling for me. I immediately gave them a hug. I wasn’t alone anymore and I knew that we could leave the building and be okay. Tomorrow we go back to Auschwitz I to work with the museum operators on one of their preservation projects. In the afternoon we are attending a lecture about resistance before heading back to Kraków for our last two nights. Don’t miss me too much, mom and dad… I’ll be home soon!